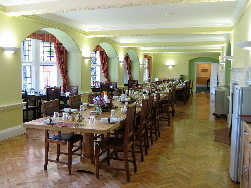 The beautifully refurbished Refectory, with its solid oak tables, provides a fitting venue for dining in the College. 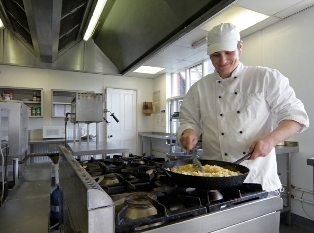 Meals are provided for all Cloister Residents here. Guests are always welcome and meals can be booked for them with the Housekeeper. When taking meals with the community, Residents who live in the Nursing Wing either dine here or in the adjacent Small Dining Room. There is a wide selection at every meal, with cereals and many items to choose from for a cooked breakfast, five main course and five dessert options at lunch, and soup followed by five savoury and three dessert alternatives at supper. Like the Upper Chapel, the beauty of the Refectory reflects the College’s status as a listed building. The style and elegance of the surroundings and quality of service all contribute to the relaxed and happy atmosphere of the corporate life here.